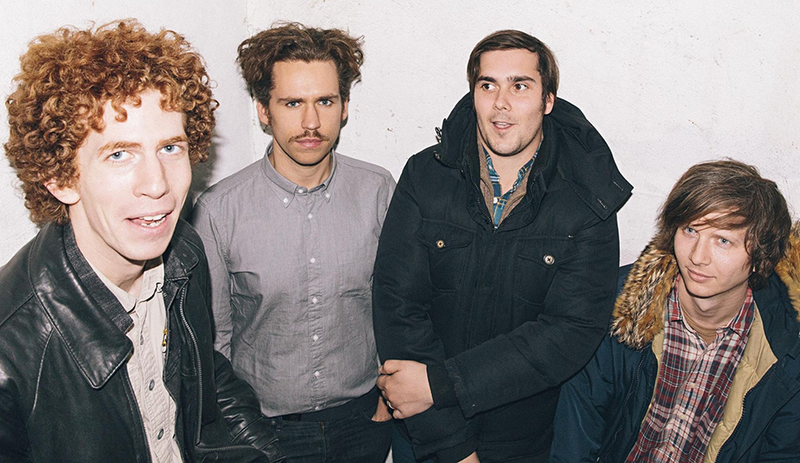 Andrew Savage is the singer and guitarist for critically acclaimed New York art punk stalwarts Parquet Courts. The band released their latest album Wide Awake! this month via Rough Trade. It’s lead-up singles are showing this to be their most punchy and cutting edge release to date, further propelled by the involvement of superstar producer Danger Mouse. MATIJA ZIVKOVIC discusses the band’s lyrical approach, the new record’s songwriting process, Bob Dylan’s Nobel, and Savage’s thoughts on the humble platypus. So where did you grow up and what got you into playing music? I’m from Denton, Texas. There was a lot of music in my house – my first favourite bands were Oasis and Smashing Pumpkins. First concert was Smashing Pumpkins, November 1st, 1996. It wasn’t long after that when I got into punk and the DIY scene and zine culture, then starting my own bands and eventually booking bands and doing shows out of my house. This is how I met Sean [Yeaton] from Parquet Courts, because I booked his band from Boston at my home in Denton. So it’s been a good 22 years of rock and roll now. I’ve been living in NY for nine years now. A lot of your songs have themes of anxiety – Dust is about air pollution, Captive of the Sun is about the claustrophobic city bustle, Berlin Got Blurry is about adjusting to a new city. These cityscapes make me of think of NY. Why does this theme about cities and isolation appeal and where did that come from? I think every artist is influenced by their home. The place where you spend the most of your time will seep into you and become a part of you, no matter how much you resist. I think isolation is a part of New York life. You seek that sort of isolation because you are confronted by a vast swamp of humanity on a daily basis. It is a part of being here – you see thousands of people every day. You hear different languages every day. There is a part of it where you feel like you’re in the world. But there is a part of it that is isolating, the yin and yang of life. Lonely but not alone or alone but not lonely. Interesting… No I don’t necessarily think it’s a bad thing. I don’t know if NY is the thing that makes me feel alienated. I probably feel that more with America than I do with New York. Ideologically, America is very split right now. NY is on one side, and is representative of that side. I was talking to an Aussie friend earlier and saying that NY feels more like the world’s city than America’s city because it is very different and indicative of a certain side of the American divide (which, unfortunately right now is bigger than it has been in my lifetime). You feel alienation with the other side? Well it can’t be unnoticed right now, it’s on the tip of everyone’s tongue. More than ever before in my life I find myself in these political discussions with people I don’t normally associate with political debate. A lot of things can’t be ignored at the moment and that definitely came across on this record. It’s on everyone’s minds and especially artists, they’re having a hard time not mentioning it in their art. With your upcoming album Wide Awake, was there a particular lyrical approach? Anything that inspired you? Well the lyrical approach with any Parquet Courts record is “How do I express this moment in time in my life”? One thing I was thinking is that we look back at different eras and we assess the culture around that. In America for instance we have this cultural fascination with the era of the Vietnam War and the music and the art that surrounded it. And the world has this fascination with the music and art and culture that surrounded the First and Second World War. I think this moment in time in America and in the world will be a moment that people are going to be reassessing and analysing for a long time. And when they’re analysing it they’re going to be talking about culture and about music, and when they do I want it to be clear what Parquet Courts was for and against in this moment in time. This is what I wanted the record to be – a declaration, a record of who we were in 2017 and 18. Your lyrics are observational and poetic at times. They evoke a lot with relatively little. Are there are any authors or poets you draw inspiration from? Sure, there are a lot of poets and certainly a lot of writers that I admire. I don’t want to make out like I am a poet, because I don’t necessarily know that I am. I think poetry is a different thing than what songwriters do even if there’s similarities there. There was a lot of discussion about that when Bob Dylan won the Nobel Prize. Should those kind of honours go to songwriters when there’s so many poets out there? Does it really need to be stated that Bob Dylan is a poet? I don’t know. There’s a lot of poets that I like though – I could name Frank Stanford, Stevie Wright, Bill Nought, William Carlos Williams, Ann Carson. These are poets that I admire – but because I don’t view what I do as poetry, it’s hard for me to assess which of those writers makes it into my work, what’s an influence, and what I enjoy as a reader. So what would your opinion be on the Bob Dylan situation – should he have won the Nobel? I don’t know if I can say he should or shouldn’t have, I guess the bigger question is, is that what the Nobel Prize for Poetry is for? Definitely he’s moving and compelling, he takes my brain and my heart to these places that poets take me. Thing is, poetry is not necessarily something that is on the tip of everyone’s tongue culturally. You’re either all in with poetry or you’re not. You don’t meet many casual poetry readers. So I wonder if that sort of honorarium should be reserved for promoting poetry as an art form. But then you have the pesky task of defining what ends up being called “poetry”? I’m glad I’m not the one that makes that decision. On the topic of non-musical forms of art – in terms of visual art, you do the album covers for Parquet Courts. What’s your approach with album cover art? They way that it normally goes is – album artwork begins after an album is recorded, so I’m immersing myself in the record and just listening to it and creating the visual for it in my head, because music is something with a very visual sensation for me. There’s a lot of just listening to it and recognising the things I’m seeing while listening to it – the colours and shapes that occur. And I consider the lyrics – I let them influence what I do. The end product is holistic. Ultimately I want someone who hasn’t heard of the band before to see the record in the store and be very curious about what’s inside it. That’s how I’ve learnt about so many bands over the years and so many records – the blind purchase. Seeing something that stuck out and going with it. On Wide Awake! you’ve collaborated with producer Danger Mouse. He’s known for his sample-heavy early productions with Gorillaz and Gnarls Barkley, and has since worked with big acts like The Black Keys and Adele. How did the collaboration come about? He came to us and was keen to work with us. It was a week before we went down to record the album – so we’d written it already. We weren’t too familiar with him but I knew this was a big guy in the world that he’s in. I was impressed – we all were really – with how keen he was to do it. He asked if we’d consider postponing so he could work with us on it. So we talked to him a lot, listened to a lot of music, and made sure he was the right guy for this – that he was going into this with the right intentions. And he was. In the record that helped us make, it’s very evident of that. Musically was there anything different you did this time around? There was this idea to do a really rhythm-forward record as opposed to a melodic-forward record, which is what [previous album] Human Performance was. There was a cognizance that we needed to make a different record and the best way to do that was to make a record where the vocal performances conformed to the rhythm and not a melody. It was suggested that this was a record that you could put on at a party. There was also a certain amount of anger that we felt needed to be expressed this time. But because there was so much anger being expressed, it was decided that there needed to be a certain amount of joy and fandom expressed. On a closing note – in a previous interview you’ve said you weren’t a huge fan of Australia or the platypus. Has your opinion warmed since then? That was a goof interview! The interviewer got this idea to do the interview about how much I disliked Australia. I was asking “are you sure this is going to be funny?”. I love Australia! This is the first winter (summer for you guys) that we haven’t been, and we will be back. I’ve got so many friends in Australia, I love going down. It should be on record – that interview was a goof! I’m neither here nor there on the platypus. I’m glad that it exists, y’know. It’s an interesting animal, some would say the most interesting. It’s venomous for Christ’s sake. But I don’t have strong opinions on it either way.